“The discovery of the world and the discovery of man, by man”. Lamartine sings with the same strain, “man discovered himself and the universe” whereas Taine opines that so long blinded, “had suddenly opened his eyes and seen”. Or any man that breathes on earth”. So we have the same glimpses of Renaissance thought in an oration by Pico Della Mirandola, ‘On the Dignity of Man’. 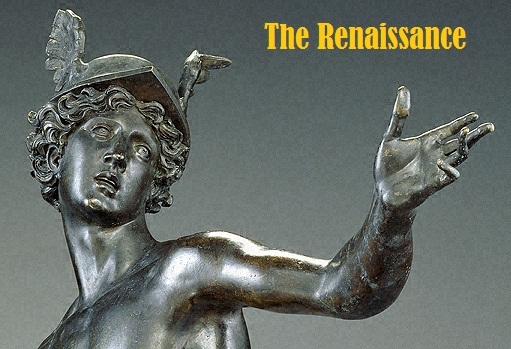 Renaissance came to mean humanism, wonder at the new earth and sky as revealed by the navigators and astronomers, perception of beauty of the Greek and Latin classics. Prof. Babbit of America coins the term ‘humanism’ and with this humanistic approach starts the Geographical discoveries. Invention of Printing Press by Gutenberg and set up by Caxton in Englnd , springing of Copernican system of Astronomy, the Reformation landing by Luther, Calvin, Knox & Huss gave a new flood of Renaissance. So ‘Renaissance’ from Italy to English wave gives the splendid welcome to the flowerings of English soil. It enlivens the drooping spirit of dark veil of medieval spot. It inspires new blooms – (a) rise of nationalism, (b) spirit of adventure, (c) love of beauty and sensuousness, (d) scientific studies, (e) belief in the dignity of man and enthusiasm for new discoveries etc. Art during the late 1400s and early 1500s were dominated by three masters – Michael Angelo, Raphael and Leonardo da Vinci. The focus of Renaissance art was on realism. Michael Angelo’s the Statue of Moses, Raphael’s portrait of Madonna and da Vinci’s The Last Supper and Mona Lisa rank high among all art till now. reacted on the modern world now emerging from tradition bound medievalism”. Aristo and Tasso had captured the readers with their powerful poetic genius in Orlando Furioso and Jerusalem Delivered; Castiglione’s The Courtier presented the renaissance ideals of fine courtly conduct and the art of living. Machiavelli’s The Prince serves as a powerful guide of a successful statesman and politician. In the geographical field discoveries crowned on Turkish conquests, conquest of Columbus (1492, America), John Cabot’s discovery of Newfoundland and Labrador in 1497, Vasco de Gama’s discovery of new India route to India (1498). The discovery of new trade routes helped to establish the commercial prosperity of countries like Spain Portugal and England. Copernicus’s theory defends the Ptolemy’s theory system of the universe. This theory of Copernicus later was supported by Kepler, a German, Galileo an Italian and William Harvey, the English physician and philologist. In the religious sphere Martin Luther brought Protestantism, Reformation came in Germany. Lutherism spread and became a clarion call for revolt. Calvinism and Anglicanism also struck at the root of Roman Catholicism. Decline of Feudal system and coming of foreign merchant became the key note of the renaissance world. The Renaissance blooms in architecture and music and in literature. Michael Angelo, Raphael, Da Vinchi, Titian, Byrd and Orlando Gibbons flourished their paintings and musical strain. The impact of the Renaissance was equally evident on all the spheres of English literature. Sir Thomas More’s Utopia was certainly influenced by Plato’s Republic. Utopia is considered the masterpiece of English humanism, embodying the concept of an ideal state which would be the opposite of that inert and barren society in which the author lived. English educationists of the period Roger Asham, Sir Thomas Elyot, Sir John Cheke, and Sir Thomas Wilson, Sir Thomas Smith highlighted the significance of not only Latin and Greek languages but are seen to be extraordinary preoccupied with Latinity : Latin pleasures, Latin elegances and Latin ways of living too! Italian sonnet style of Petarch imported to England. Wyatt, Surrey, Sidney, Spenser, Daniel, Drayton and Shakespeare flourish the sonnets in the mastery fashion. Lyrical works and epical poems also get its full growth in the Renaissance impetus. Sidney’s Astrphel and Stella Spenser’s Hymns in Honour of love and Beautie, pastoral elegy and love songs- Epithalamion and Prothalamion are the superb flowerings ever bloomed. Moreover, Drayton’s Idea, Daniel’s The complaint of Rosamond and Ben Jonson’s Moral Lyrics may be mentioned here too. In Spenser’s The Faerie Queene, Daniel’s The Civil war and The Barons war, epic poetry magnetized the hearts of mankind. Prose works also get its foundation like Sidney’s Arcadia, Lily’s Euphues, Lodge’s Rosalynd and Greene’s Pandasto and the essays of Bacon, Sidney, Daniel, Webb and others. In the Dramatic field Gorboduc; the 1st tragedy based on Seneca was produced. The Misfortunes of Arthur, Jocasta are also of same types. Comedies like Ralph Roister Doister and Gammer Gurton’s Needle were flourished in this era. Lyly, Peele, Greene, Kyd, Marlowe, the master dramatists get the platform to bloom their dramatic flowers. Shakespeare stands supreme in this platform. Sidney’s An Apology of Poetrie is the criticism of Renaissance epitome. (‘Colonialism’ has its origin in the seed of Renaissance). Yes, that’s the panacea of all ages to come.